Years ago, in Zenhax there was a post about Ace Combat Assault Horizon QDF files, however, despite the QDF containing the main game files, other ones still are not decrypted yet, thing that in the PS3/X360 version of Assault Horizon, Ace Combat Infinity, Ace Combat 6(about FHM itself, because the main container uses .PAC with XORed deflate compression), and MachStorm don't even use QDF containers. Using Ace Combat Infinity for example, the main file consists of : EBOOT.BIN which is the game executable with the commands and configuration to run, files are in .PAC, DATA00/01/90/91 uses DPL header, DATA99 it´s just game warning and logos(with some bits of menu layout), DATA10/11/12/13/14/20/21 use CPK instead, which is criware compression, the CPK ones just store audio(10-14) and video cutscenes(20-21). now about DATA00/01/90 store the main game files like models, textures, and etc... along of DPL, there´s one more layer of container called FHM(used by Namco since Time Crisis from PS1), which is the one used to store models(NDXR) and textures(NTXR? ), and other files in general. 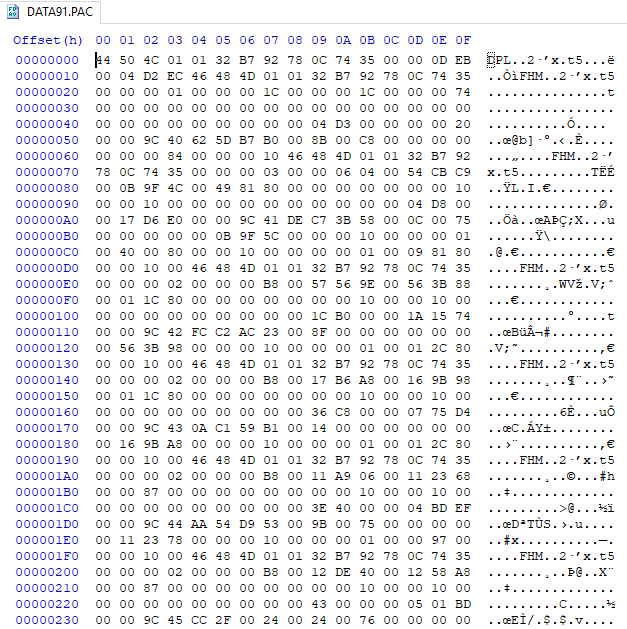 However, inside the decompressed QDF files, there's a file called DATA.PAC which uses DPL header(along as other file called datapack.bin, which is a file list/data table outside of the unpacked QDF), by analysis, noticed that this file also store models/textures and in-game system files.